Please send me more information on Cabo Mar Catamaran Tour! 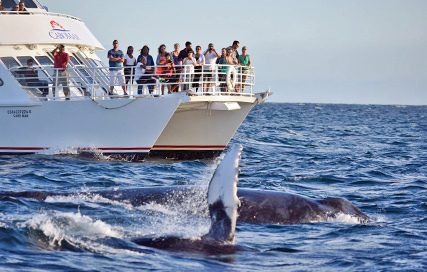 Put on your dancing shoes and head out on this great catamaran tour in Cabo! Cabo Mar was built in 2005 and is a 65 foot, double-decker super power catamaran comfortably holding up to 150 passengers. The "Cabo Mar" and its Latin rhythms will have you swaying to the beat, cool cocktail in hand. Dance to today's top hits and Latin inspired rhythms aboard Cabo's newest super power catamaran, the Cabo Mar. Enjoy our Unlimited Premium Bar, as you cruise by the famous Arch, Lover's beach and Sea Lion Colony. 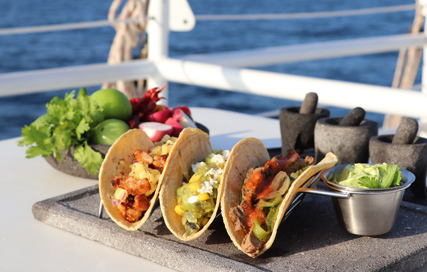 The tour then returns to the bay and sets anchor as the crew serves up mouthwatering marinated beef and chicken brochettes, grilled veggies, quesadillas, homemade mashed potatoes, grilled corn on the cob, fresh baked bread and butter, quesadillas, chips, salsa and brownies. Throughout the tour the Latin rhythms of Salsa, Merengue, and Cumbia will be featured. This is a tour that will feed your need to dance as well as your taste in great food. The lively crew will ensure that fun is had by all! Tour Includes: Two and a half hour sunset tour including grilled steak and chicken brochette dinner with salsas and freshly grilled vegetables. Open international bar also offered featuring a tropical bar of mojito, pina colada or daiquiri (Sodas and bottled water also available). This trip is a 2-hour Pacific Sunset Tour which includes dinner, open bar, sodas and bottled water. This trip is a 2-hour Pacific Sunset Tour which includes open bar, sodas and bottled water. Four-hour tour to Chileno Bay and includes all snorkel equipment, open bar, juices, sodas and bottled water and lunch. Lunch is your choice of either Mexican-themed menu (ceviche, tuna salad, guacamole, chips and salsa) or our American menu (fresh bread, select cheeses, deli meats, condiments, chips and fresh fruit). Prices quoted include IVA/sales tax, port charges (if applicable). All tours depart from Dock #4.